> Blog>Blog Home>Is It Time to De-winterize Your RV’s Plumbing? Is It Time to De-winterize Your RV’s Plumbing? For those of you in the Snowbelt, it’s been a long, hard Winter with your RV’s and Travel Trailers tucked safely away in storage. Now that Spring is finally here, it’s time to spring your beloved rigs from their seasonal prisons. Before you hit the highway for another fantastic season, you’ll need to de-winterize and get your RV back into tip-top shape, paying special attention to the plumbing and water systems. Even if you’ve been lucky enough to use your rig all Winter, now might be a good time to give it a once over and complete any necessary RV maintenance and repairs. Remember how much time and care you spent winterizing your RV last Fall? It’s time to flip it into reverse and get it ready for new seasons of fun. As with winterizing, special care and attention must be placed on the RV plumbing and water systems. Let’s run through some of the absolute necessities of de-winterizing. For the purposes of this blog, let’s assume that you winterized your rig’s plumbing by filling the system with non-toxic RV antifreeze and bypassing the water heater. This is the most common method that most RV’ers use. With the RV water heater still in bypass mode, and any RV water filter cartridges removed, connect your rig to a fresh water source. Open all of your RV faucets … RV sink, RV bathtub, RV outdoor kitchen, RV shower … and let the water run until it is clear of any traces of antifreeze. Most folks find that this will take around 10 minutes. While the lines are flushing, check for any leaks, cracks or broken hoses. It’s better to find and replace small issues now before they become big problems! Be sure to flush the RV toilet a few times as well … without paper, of course. Now that the lines are clear of antifreeze, you can now switch the RV water heater out of bypass mode and begin filling it. But first, you will need to open a hot water faucet and allow the tank to aerate before it completely fills. You may want to have a rag or bucket at the ready, in case of any sputtering or splashing as the air leaves the lines. Once the tank is full, it is recommended to run it through 2 full cycles. Run one cycle on 120-volt power and another with the propane tank to be sure there are no issues with either power source. Now that your water system is clear of antifreeze, it’s time to sanitize the RV water system so it is safe to use once again. Before you start, make sure all of the drains are closed and drain plugs are installed. For every fifteen gallons of water that your fresh water tank holds, add one-quarter cup of liquid household bleach. Mix the necessary amount of bleach with water into a one-gallon container and pour it into the fresh water holding tank. Turn on your rig’s water pump and run water through all hot and cold faucets until you smell the bleach. Close the faucets and let the solution sit for twelve hours. Then drain and refill the system and flush it out until the water tastes and smells bleach-free. Now that all traces of RV antifreeze and bleach have been removed, you can reinstall any water filter cartridges. The antifreeze you just flushed is now in your gray and black water holding tanks and will need to be emptied when you have access to a suitable disposal site. Now is also a great time to go room-to-room and do a thorough check of all of your plumbing fixtures and components. If you’re lucky enough to have one, how is your RV bathtub? Does your RV shower pan need replacement? Is the RV showerhead free of leaks and cracks? Has the toilet seen better days? Need some extra room in the kitchen? Now is a great time to measure and order an RV sink cover to maximize your space. Love spending time outside? Don’t forget your outdoor kitchen and shower components. Consider keeping some spare hoses on hand for unexpected blowouts or leaks. If you don’t already have one, now is a great time to consider installing an RV water filtration system. You may want to look at inline systems to control and remove bacteria, lead and other dangerous contaminants found in your drinking water. You could also choose to filter the entire system, which will even leave you with purer water in the shower or bath, reducing skin irritations. Now that your RV plumbing and water systems are ready to go, the rest of your Spring cleaning should be a breeze! 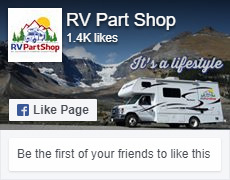 RV Part Shop has everything you need from inside to outside, roof to tires, awnings to slideouts, replacement furnishings, parts, accessories and so much more! With fast FREE shipping on most orders, you can what you need NOW and eliminate any downtime once the season has really started. Can’t find what you need in our EXTENSIVE online selection? Then give us a call toll-free at (877) 223-0343 during regular business hours. Or, drop us a line using our handy online form.